The official Predator Facebook page has officially announced a new Predator film, via a messy, ugly poster that studio execs presumably went nuts for. “You’ll never see him coming,” proclaims the poster, putting those who believe that America isn’t ready for a female or non-gender specific Predator at ease. Titled The Predator, it would appear this film will feature only one Predator, unlike Predators, which featured more than one Predator. (It will certainly help your cool English teacher in making a point.) Predator 2 was misleading, as it featured a single Predator until the last moments of the film, and those guys weren’t even that predatory, they just hung out on the ship drinking Coors Banquet like a bunch of mopes at the hunting lodge. 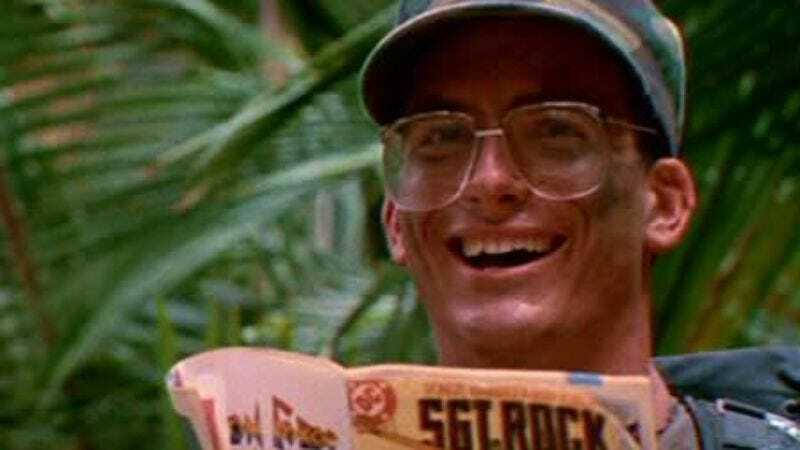 All kidding aside, The Predator writer/director Shane Black re-teaming with co-writer Fred Dekker is certainly a cult film fan’s dream, as Black portrayed Hawkins in the original film and the two men co-wrote 1987’s The Monster Squad. (Dekker is also responsible for the cult classic Night Of The Creeps.) The new film is being called ”an inventive sequel” rather than a reboot, so perhaps audiences will finally get something in the vein of the abandoned Jaws 3, People 0 concept? No word on when hunting season begins…again.